This week I launched a project that I am doing in the North West of England in conjunction with our Ofsted Big Conversation steering committee. The idea for the project came about after Ofsted released their findings in relation to the number of children who achieve a Good Level of Development (GLD) at the end of the Reception year. 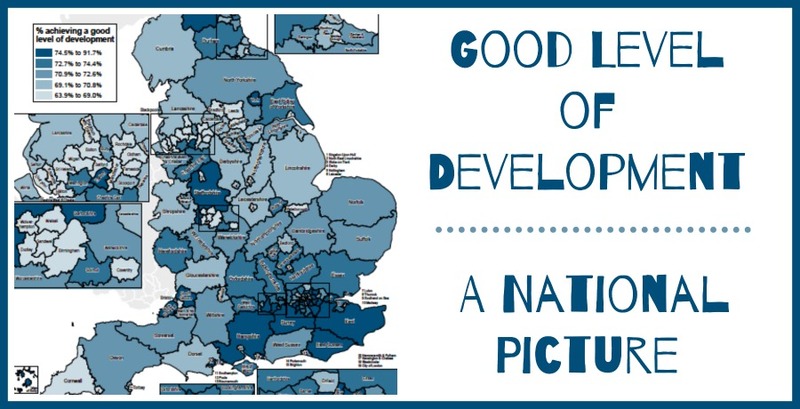 This is their Good Level of Development by Local Authority map for 2017/18. The North West region, where I live and worked for my entire teaching career, has a high number of Local Authorities where the attainment of GLD is in the lowest National band. The idea of the project is to provide some really cost effective training over the course of a year. We will swap ideas and develop practice in order to support children’s ongoing development and progress. This is not ‘How To Achieve A Good Level Of Development’ training! As we know, all children are individuals and therefore develop at different rates. They come into the Early Years with a variety of experiences, interests and motivations to learn. This project is about how to harness the uniqueness of each child and use that to enable their learning. I will be talking about mathematics, phonics and writing, all of the things that often (wrongly) get pushed to the forefront of a child’s learning experience. But, we will be exploring and investigating successful approaches to learning that recognise the key skills that children need to have at every stage of their learning journey. The message that I want practitioners to take away is one about the importance of play as a promotor of wellbeing and a vehicle for life long learning – I am REALLY looking forward to getting started. This project is only open to PVI settings and Childminders in the North West of England (as defined by the map above). There will be six training sessions, some small practitioner projects to complete in-between training and a closed Facebook group for peer support. The cost of ALL six training sessions is £99 per delegate. There is a maximum of two delegates per setting. Here is a short video that I made with Jennie Johnson, who is CEO of Kids Allowed Nurseries and the Chair of the Ofsted Big Conversation North West, for more information. (Look out for the loo roll! ).